Suzanne Rousseau (left) and her sister Michelle. 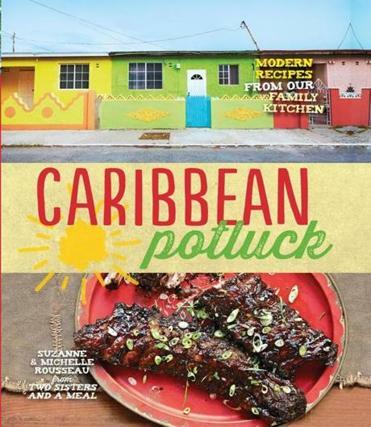 Caribbean cuisine is more than jerk chicken and patties, what Michelle and Suzanne Rousseau refer to as “brown food.” With their new book, “Caribbean Potluck,” the Kingston, Jamaica-based sisters present a new face for island cuisine: young, sophisticated, and in tune with the region’s complex history and culinary traditions. The Rousseau sisters include recipes for classics such as jerked pork and Guyanese pepper pot, and unexpected fare such as roasted pepper and pumpkin soup and smoked marlin ceviche crostini. Jerk chicken makes an appearance in a spring roll and lasagna. It’s an approach to cooking that the sisters see as reflective of the “everyday luxury” of island living, where eating fresh seafood on the beach is part of daily life. 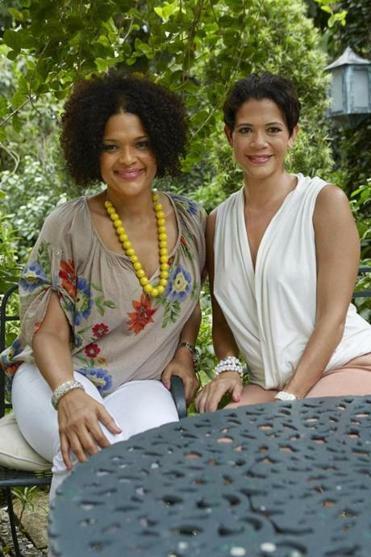 As hosts and producers of the television series “Two Sisters and a Meal,” and a follow-up Web series, Suzanne, 42, and Michelle, 44, have traveled throughout the Caribbean to shine a spotlight on traditional cooking and culture, to highlight the diversity of the cuisine for a Caribbean audience. With “Potluck,” the chefs are looking to spread the word farther afield. “The best things you can eat is street food and the best cooks are home cooks,” says Michelle. Q. What is the hallmark of everyday island cooking? Suzanne: As the Caribbean has become more of a First World culture, more of the young generation has failed to realize the gift of our history. It’s really a mix-up, or as we say, “blenda” of culture that influences the food of the region. Michelle: Oftentimes in Jamaica, there’s a socioeconomic status associated with eating certain ways. What we try to do is share the same level of enthusiasm and energy for all food. Give it equal value. Suzanne: The divide between the wealthy and poor is quite significant. We’ve tried to shine light on things that the culture has lost sight of. Just approach it with authenticity and do it in a first-class way. Michelle: You take for granted things that are part of your everyday experience. But there’s real value in looking at those things. Q. You’ve been working together for 20 years. How did you decide to do that? Suzanne: We were both arts majors in university. Our mother had a decorating showroom and wanted to open a cafe. When it fell through, she said, “Why don’t you do it anyway?” It was low-key: salad and light food that we couldn’t get at home in 1994. Since then it evolved. We took classes at the Culinary Institute of America and opened a fine-dining restaurant. We had a deli. Most of our time is spent in off-premise, large-scale catering work. Michelle: When we worked together there was a magic in how we create and bring things to life. We think alike, although we are very different. We are natural communicators. As we grew, we also understood how we can tap into those gifts to articulate and develop a different voice for Caribbean people. Michelle: The origin of the word is British — in taverns in England at the end of the day, visitors would get what is left in the pot. Nowadays it’s really about a shared experience. It reflects the social part of the islands where everyone is your aunt and uncle. Suzanne: It’s also a mix-up of the items that different people can bring to the table, the medley of things that we’ve picked up from our travels. Michelle: The islands have so much in common, more than they have differences. There are common bonds that form a string of continuity as you go from place to place. No matter how long you leave it, it’s your apron string that draws you back. That’s a gift. Q. What would other cooks be surprised to discover about Caribbean cuisine? Michelle: The range and diversity of ingredients and flavors used across the region. If you go to Trinidad, there’s a massive influence of Hindus and Muslims. The flavor profiles of certain islands reflect their histories. Suzanne: Trinidad is one of the most exciting places to eat. They have fantastic street food. Indian food is now Trini food. They have roti, curry mango, and curry pumpkin. Every island has fantastic food. The food diversity has not been translated, even for Jamaicans. Michelle: Caribbean food can be very pretty. It’s not just brown food. It’s simple, like farm-to-table food. Interview was condensed and edited. Michael Floreak can be reached at michaelfloreak@gmail.com.